Headaches are the everyday-thing for mostly everybody in the world. everybody has an aspirin, ibuprofen or naproxen pills in the medicine cabinet. This pills not only give you a fast relief but also a high risk of producing a gastric ulcer. Every year 500 000 Americans are diagnosticated gastric ulcer, not only for an﻿ti-inflammatory drugs but for smoking tobacco, drinking alcohol or a high caffeine intake. However, this hasn't started last year. Many years ago, researchers have found that the Taspina alkaloid stimulates the migration of fibroblast, which accelerates the process of wound healing created by gastric ulcer. The plant called Dragon's blood (Sangre de Grado) has a high content of Taspina alkaloid, that has been use to repair and contract scars since ancients times. 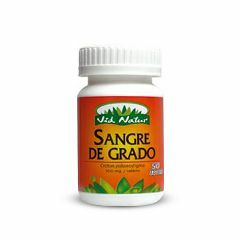 The Dragon's blood (Sangre de Grado) is a natural wound healer and it's being used as gastric ulcer reliever due to its amazing healing characteristics. Lately, it's been commercialized in Pure Extract pills in a very low price. These pills come in a presentation of 50 tablets to take twice a day.